Most of the known approaches to the synthesis of CF3-containing organic compounds suffer from serious drawbacks. For example the starting materials required for these methods are rather difficult to obtain, or they are fairly toxic and inconvenient to work with and methods for direct fluorination and trifluoromethylation do not always allow the introduction of the CF3-group at the required position of a molecule. An efficient and attractive regioselective synthesis of a series of novel pyrazoles containing the trifluromethyl moiety was achieved using Cu(OTf)2/Et3N as an efficient catalytic system under ultrasonic irradiation. Cu(OTf)2/Et3N catalyst showed a great advantage over all the investigated catalysts, and the ultrasonic irradiation method offered high yields of pyrazoles in short reaction time compared with classical conditions. gHMBC spectra of the product were used to rationalize the observed regioselectivity. Over the last two decades there has been rapid progress in synthetic organic chemistry associated with the search for new organic compound derivatives with desirable properties. Such compounds are widely used in the pharmaceutical industry. Among the several FDA approved pharmaceutical drugs, the pyrazole core is found in rimonabant (1), and celecoxib (2) (Figure 1) . Examples of pharmaceutically relevant pyrazoles. Pyrazoles exhibit significant biological properties such as antihyperglycemic , analgesic , anti-inflammatory , antipyretic , antibacterial , hypoglycemic  and sedative-hypnotic activities . The trifluoromethyl group is a very important substituent in medicinal chemistry, due to its unique stereoelectronic properties. A trifluoromethyl group usually increases the lipophilicity of a molecule, improving its transport characteristics in vivo. Furthermore, the strength and durability of the C-F bond compared with the С-Н bond (116 and 100 kcal/mol respectively) allows undesirable metabolic transformations to be avoided. So the introduction of trifluoromethyl groups into bioactive molecules has become very important in pharmaceutical studies, stimulating work directed towards the elaboration of synthetic methodology for compounds containing trifluoromethyl groups. Because of all these factors, organofluorine chemistry has been vigorously developing during the past two decades . Most of the known approaches to the synthesis of CF3-containing organic compounds suffer from serious drawbacks. First of all, the starting materials required for these methods are rather difficult to obtain, or they are fairly toxic and inconvenient to work with. 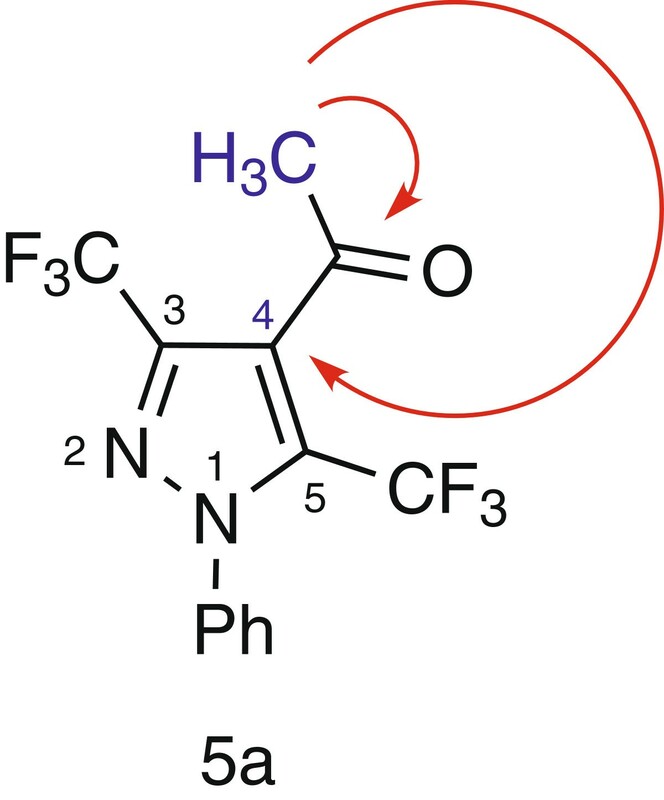 Additionally, methods for direct fluorination and trifluoromethylation do not always allow the introduction of the CF3-group at the required position of a molecule. It is worth mentioning that most of the reported methods for synthesis of CF3-containing pyrazoles suffer from formation of mixures of regioisomers. Pavlik et al. studied the reactivity of CF3-enones towards N-substituted hydrazines where a mixture of regioisomers was obtained. Also, in the reaction of β-alkoxy substituted enones with N-methyl hydrazine two isomeric dihydropyrazoles were obtained [10, 11]. Singh et al. investigated the reactivity of 3-(ethoxymethylene)1,1,1-trifluropentan-2,4-dione with various aryl and heteroaryle substituted hydrazines, and a mixure of pyrazoles formed . Nenajdenko et al. obtained CF3-conatining pyrazoles with 100% regioselectivty from the reaction of α-bromo-ethoxy-trifluromethyl enone with aryl hydrazine, but with lower yield . As a result the more flexible “synthon” approach, based on the application of simple and readily available fluorine-containing compounds has gained substantial interest . Nitrilimines containing a fluro or trifluoromethyl moiety (liberated in situ from the corresponding hydrazonyl halide) are easily available compounds which can be prepared by various methods  and fairly convenient building blocks to prepare heterocyclic compounds containing a trifluoromethyl group. It is evident from the recent literature that copper triflate [Cu(OTf)2] has invoked enormous interest as a green and potential Lewis acid catalyst to construct carbon–carbon and carbon– heteroatom bonds in various organic transformations [16–23]. Despite its great importance, only a few papers have reported on its catalytic application in organic synthesis . Ultrasound irradiation has been utilized to accelerate a number of synthetically useful reactions during the last few years. Cavitation is the formation, growth and collapse of bubbles in an irradiated liquid. This effect induces very high local pressure and temperatures inside the bubbles and enhances mass transfer and turbulent flow in the liquid . Ultrasound has been utilized to accelerate a number of synthetically useful reactions, especially in heterocyclic chemistry [26–36]. As part of our ongoing interest in sonochemistry [37–42], and in a continuation of our interest in the synthesis of a wide range of heterocyclic systems for biological screening programme in our laboratory [43–51], we will introduce here a novel and efficient regioselective synthesis of trifluromethyl containing pyrazoles under ultrasonic irradaition promoted by catalytic amount of copper triflate and triethylamine. A wide variety of catalysts were scanned for the reaction of N-phenyltrifluromethylcarbohydrazonoyl benzenesulfonate (3) and 1,1,1-trifluoropentane-2,4-dione (4a) (Scheme 1) in ethanol under ultrasound irradiation as a model reaction (Table 1). These catalysts are sodium ethoxide, triethylamine, copper triflate, copper triflate/triethyl amine, which were selected to promote the mentioned reaction. Regioselective synthesis of pyrazole derivative 5a using various catalysts under ultrasonic irradiation. Absolute ethanol was selected as solvent due to the solubility of the two starting materials. Thin layer chromatography (TLC) used to follow the reaction progress. It is clear from the results cited in Table 1, that only one isolable unique product was obtained (as examined by TLC). The best yield of 90% of the isolated product was reached using Cu(OTf)2 and Et3N, each of 0.05 equiv. (entry 7). The reaction gave relatively low yield when 0.05 or 0.1 equiv. of Et3N alone was used (entry 3,4). Furthermore, sodium ethoxide base gave a trace amount of product (entry 2) and no reaction was observed in the absence of catalyst or using Cu(OTf)2 as catalyst in 5 or 10 mol% (entry 1,5,6 respectively). Also from Table 1, the effect of loading (Mol%) on the% yield of isolated product was studied, and it is clear that 0.05:0.05 equiv. of Cu(OTf)2 and Et3N furnishes the respective product in a quantitative yield (Table 1, entry 7,8). It is worth mentioning that we followed the above reaction to completion using GC-MS and the resulting products were identified from their retention times. It was found that 100% regioselectivity was attained in presence of Cu(OTf)2 with Et3N (Table 1, entry 7 and 8) but in the presence Et3N only (Table 1, entry 3 and 4) there was a very small amount (traces) of other product detected by GC-MS, which completely disappeared in recrystalization of the crude product to give only pure 5a. The isolated product was identified as the pyrazole structure 5a, although two regioisomeric cycloadducts 5a and 6a seemed possible (Scheme 1). Unambiguous structure determination of the obtained products is therefore crucial to rationalize the observed regioselectivity. Structure elucidation was conveniently achieved on the basis of the 1H-13C connectivities (gHMBC) showed by methyl protons towards the carbonyl group and C-4 of pyrazole. On this basis, the analysis of gHMBC spectra of the product led us to attribute the signal at δ 191.65 ppm to the quaternary carbon (carbonyl group) owing to its correlation peaks with the methyl protons at δ 2.65 ppm; also, the signal at δ 112.11 ppm to the C-4 of the pyrazole owing to its correlation peaks with the methyl protons at δ 2.65 ppm. This observation indicated that the methyl protons correlate to carbonyl functional group and the C-4 of the pyrazole, which is in accordance to the structure 5a (Figure 2). Therefore, 1H-13C HMBC of the product formed provides sharp evidence for the existence of regioisomer 5a and rules out the other alternative structure 6a. Consequently the reaction product was identified as the pyrazole structure 5a (Scheme 1). Diagnostic correlations in the gHMBC (red arrows) in compound 5a. The formation of pyrazole product 5a is in line with the well established earlier studies for β-diketones containing highly fluorinated groups, in which the enolic content predominates, as in Figure 3[52–54]. The carbonyl group adjacent to the perfluoroalkyl chain enolizes preferentially. It is reasonable to propose a mechanism for formation of the pyrazole 5a under the adopted reaction conditions (Scheme 2). Pyrazole 5a was assumed to form via nitrile imine 7 (liberated in situ from 3 by the action of triethylamine and release triethyl ammonium salt) which involved a more or less concerted cycloaddition reaction. In the Cu(OTf)2-catalyzed addition reactions it reacts with the enolized form of β-diketone 4a II to generate copper(II) intermediate 8 and release of triflic acid (TfOH). The nitilie imine 7 reacts with intermediate 8 to give non isolable intermediate 5-hydroxy-2-pyrazoline derivative 9, and cyclizes via elimination of molecule of water to yield the desired regioselective pyrazole derivatives 5a. A Proposed Mechanism for Cu(OTf)2/TEA-Catalyzed regioselective synthesis of pyrazole. A Proposed Mechanism for Cu(OTf) 2 /TEA-Catalyzed regioselective synthesis of pyrazole. Therefore, copper(II)triflate has an important role in which it activates the enolic O-H bond of β-diketone to initiate the reaction. The scope and generality of this protocol was tested using another derivative of β-diketone 4b with N-phenyltrifluromethylcarbo-hydrazonoyl benzenesulfonate (3) as shown in the Scheme 3 under the optimized reaction conditions, and the corresponding pyrazole derivatives 5b were obtained in excellent yield. Regioselective synthesis of pyrazole derivatives 5a,b using Cu(OTf)2/Et3N catalyst under both ultrasonic irradiation and conventional method. Regioselective synthesis of pyrazole derivatives 5a,b using Cu(OTf) 2 /Et 3 N catalyst under both ultrasonic irradiation and conventional method. Also, to find the specific effect of ultrasound on these reactions, all previously mentioned reactions were carried out under the same conditions in the absence of ultrasound irradiation (Table 2). It was observed that the reaction time increased considerably and the yield of the products decreased. Thus, ultrasound was found to have a beneficial effect on the synthesis of pyrazole derivatives, in which the time of the above reactions decreased from 8 to 10 h in the conventional procedure to less than 1 h. Also, there was an improvement in the yields of the reactions under ultrasonic irradiations. We extended our study to find out the reactivity of β-diketone 4a,b towards the α-ketohydrazonoyl halides 10a-f under ultrasonic irradiation and/or conventional method to give the corresponding pyrazole derivatives 11a-l in 85–91% yields (Scheme 4, Table 3). Regioselective synthesis of pyrazole derivatives 11a-l using u(OTf)2/Et3N catalyst under both ultrasonic irradiation and conventional method. Regioselective synthesis of pyrazole derivatives 11a-l using u(OTf) 2 /Et 3 N catalyst under both ultrasonic irradiation and conventional method. The structure of pyrazole derivatives 11a–l was assigned on the basis of their elemental analyses and spectral data. For example, the 1H NMR spectrum of compound 11a revealed two singlet signals at δ 2.29 and 2.74 due to the two methyl groups in addition to aromatic multiplet at δ 7.31–7.71. The mass spectrum of the same compound revealed a peak corresponding to its molecular ion at m/z 296. The mechanism of the formation of compounds 11a-l is in line with those depicted in Scheme 2. From the data cited in Table 3, it was observed that the reaction time increased considerably and the yield of the products decreased under conventional method. Thus, ultrasound was found to have beneficial effect on the synthesis of pyrazole derivatives in which decrease time of above reactions from 7 to 11 h in conventional procedure to 45 min. to 1 h. Also, there was a noticeable improvement in the yields of the reactions under ultrasonic irradiations. The improvement induced by ultrasound in the above mentioned reactions can be attributed to the well established theory for the cavitation, The collapse of bubbles caused by cavitation produces intense local heating and high pressures [55, 56], so reaction time decreases clearly and high% yield was obtained. An ultrasonic assisted efficient protocol for the regioselective synthesis a series of novel pyrazoles containing the trifluromthyl moiety utilizing an efficient catalytic system Cu(OTf)2/Et3N was reported. Cu(OTf)2/Et3N catalyst showed a great advantage over all the investigated catalysts and ultrasonic irradiation method offered high yields of pyrazoles in short reaction times compared with classical conditions. gHMBC spectra of the product were used to rationalize the observed regioselectivity. All organic solvents were purchased from commercial sources and used as received unless otherwise stated. All chemicals were purchased from Merck, Aldrich or Acros and used without further purification, thin-layer chromatography (TLC) was performed on precoated Merck 60 GF254 silica gel plates with a fluorescent indicator, and detection by means of UV light at 254 and 360 nm. All melting points were measured on a Stuart melting point apparatus and are uncorrected. IR spectra were recorded in IR spectra were recorded in the Smart iTR which is an ultra-high-performance, versatile Attenuated Total Reflectance (ATR) sampling accessory on The Nicolet iS10 FT-IR spectrometer. The NMR spectra were recorded on a Varian Mercury VX-300 NMR spectrometer. 1H spectra were run at 300 MHz and 13C spectra were run at 75.46 MHz in dimethyl sulphoxide (DMSO-d6). Chemical shifts were related to that of the solvent. Assignments are made using 1H, 13C, gHMBC, 2D experiments was done using standard Varian methods. Mass spectra were recorded on the Thermo ISQ Single Quadrupole GC-MS. The resulting products were identified from their retention times by GC–MS analysis. Elemental analyses were carried out on EuroVector instrument C, H, N, S analyzer EA3000 Series. Sonication was performed by Techno-gaz sonicator (with a frequency of 37 kHz and ultrasonic peak max. 320 W). N-phenyltrifluromethylcarbohydrazonoyl benzenesulfonate (3), α-ketohydrazonoyl halides 10a-f were prepared according to the reported literature. Typical procedure for synthesis of pyrazole derivatives 5a,b and 11a-j. In an Erlenmeyer flask, a mixture of β-diketone (4a,b) (1 mmol) and appropriate hydrazonoyl benzenesulfonate (3) and/or hydrazonyl halides (10a-e) (1 mmol) (3) was taken in absolute ethanol (30 ml) in the presence of Cu(OTf)2/Et3N (5:5 mol%) as catalyst then subjected to ultrasonic irradiations for appropriate time (cf. Tables 1, 2,3). All The reactions were kept at 70–80°C (the temperature inside reaction vessel was 70–76°C and the reaction flask was put in the mid of sonicator bath to to achieve effective cavitations). The sonochemical reactions were continued until the starting materials were no longer detectable by TLC. After the completion of the reaction, EtOAc (30 mL) was added to dilute the reaction solution. Then, the mixture was washed with water. The combined organic phases were dried and concentrated in vacuo, and the remaining residue was purified by recrystalization from ethanol to afford pyrazole derivatives 5a,b and 11a-j. The above reaction was studied also by using various condition and catalysts. (i) in absence of catalyst: this process was performed as described above and no product formed (ii) in presence of equivalent amount from sodium methoxide, this process was performed as described above and only a trace of product obtained identified as 5a (cf. Table 1) (iii) in presence of different ratio of triethylamine (0.05 mmol) or (0.1 mmol) also, these processes were performed as described above and the progress of the reaction was monitored by TLC, the product formed was identified as 5a in each case (cf. Table 1) in different percent yield, (iv) in presence of different ratio of copper (II) triflate (0.05 mmol) or (0.1 mmol) also, these processes were performed as described above and no product formed. These processes were performed on the same scale described above for sonicated reaction. Here the reactant and catalyst were put in ethanol under reflux for suitable time (cf. Tables 2 and 3) until the starting materials were no longer detectable by TLC. The products were obtained and purified as described above in sonicated reaction. M.p. = 211–213°C; IR (KBr): 1712 (C = O), 1611 (C = N) cm-1; 1H NMR (300 MHz, CDCl3) δ: 2.65 (s, 3H, CH3), 6.52-7.23 (m, 5H, ArH’s); 13C NMR (75.46 MHz, CDCl3) δ: 31.42, 112.11, 118.00, 119.58, 123.89, 126.24, 129.30, 136.87, 139.00, 154.62, 191.65. MS (m/z): 322 (M+). (Calc. : C, 48.46; H, 2.50; N, 8.69. C13H8F6N2O Found: C, 48.72; H, 2.38; N,8.55). M.p. = 227–228°C; IR (KBr): 1708 (C = O), 1601 (C = N) cm-1; 1H NMR (300 MHz, CDCl3) δ: 7.22-7.69 (m, 10H, ArH’s); 13C NMR (75.46 MHz, CDCl3) δ: 116.05, 119.18, 121.94, 125.54, 126.33, 128.52, 128.53, 129.14, 130.25, 136.89, 139.34, 139.74, 152.87, 193.16. MS (m/z): 384 (M+). (Calc. : C, 56.26; H, 2.62; N, 7.29. C18H10F6N2O Found: C, 56.50; H, 2.52; N,7.15). M.p. = 192–194°C; IR (KBr): 1712, 1699 (2 C = O), 1594 (C = N) cm-1; 1H NMR (300 MHz, DMSO-d6) δ: 2.29 (s, 3H, CH3), 2.74 (s, 3H, CH3), 7.31-7.71 (m, 5H, ArH’s); 13C NMR (75.46 MHz, DMSO-d6) δ: 29.15, 31.54, 115.15, 122.01, 125.53, 125.54, 127.41, 129.14, 131.06, 139.98, 150.98, 196.24, 199.09. MS (m/z): 296 (M+). (Calc. : C, 56.76; H, 3.74; N, 9.46. C14H11F3N2O2 Found: C, 56.50; H, 2.52; N,7.15). M.p. = 213–214°C; IR (KBr): 1710, 1701 (2 C = O), 1599 (C = N) cm-1; 1H NMR (300 MHz, DMSO-d6) δ: 2.24 (s, 3H, CH3), 7.16-7.67 (m, 10H, ArH’s); 13C NMR (75.46 MHz, DMSO-d6) δ: 28.98, 115.24, 120.07, 124.13, 126.22, 128.11, 128.12, 129.85, 133.54, 139.47, 152.00, 194.01, 198.19. MS (m/z): 358 (M+). (Calc. : C, 63.69; H, 3.66; N, 7.82. C19H13F3N2O2 Found: C, 63.96; H, 3.14; N,7.67). M.p. = 175–177°C; IR (KBr): 1711, 1697 (2 C = O), 1601 (C = N) cm-1; 1H NMR (300 MHz, DMSO-d6) δ: 2.31 (s, 3H, CH3), 2.59 (s, 3H, CH3), 7.24 (d, 2H, J = 8.4 Hz, ArH’s), 7.55 (d, 2H, J = 8.4 Hz, ArH’s); 13C NMR (75.46 MHz, DMSO-d6) δ: 26.94, 31.20, 113.54, 115.23, 119.08, 123.94, 132.15, 137.65, 152.89, 162.41, 195.00, 198.23. MS (m/z): 314 (M+). (Calc. : C, 53.51; H, 3.21; N, 8.91. C14H10F4N2O2 Found: C, 53.78; H, 3.10; N,8.75). M.p. = 201–203°C; IR (KBr): 1719, 1701 (2 C = O), 1603 (C = N) cm-1; 1H NMR (300 MHz, DMSO-d6) δ: 2.28 (s, 3H, CH3), 7.21-7.84 (m, 9H, ArH’s); 13C NMR (75.46 MHz, DMSO-d6) δ: 27.98, 112.03, 115.87, 119.26, 125.44, 128.31, 132.05, 135.16, 136.49, 149.97, 162.00, 191.24, 196.20. MS (m/z): 376 (M+). (Calc. : C, 60.64; H, 3.21; N, 7.44. C19H12F4N2O2 Found: C, 60.95; H, 3.07; N,7.27). M.p. = 194–196°C; IR (KBr): 1707, 1697 (2 C = O), 1600 (C = N) cm-1; 1H NMR (300 MHz, DMSO-d6) δ: 2.26 (s, 3H, CH3), 2.61 (s, 3H, CH3), 7.44 (d, 2H, J = 8.1 Hz, ArH’s), 7.67 (d, 2H, J = 8.1 Hz, ArH’s); 13C NMR (75.46 MHz, DMSO-d6) δ: 29.91, 32.42, 117.21, 123.94, 124.36, 124.85, 126.03, 129.54, 138.03, 143.11, 151.98, 192.10, 196.85. MS (m/z): 364 (M+). (Calc. : C, 49.46; H, 2.77; N, 7.69. C15H10F6N2O2 Found: C, 49.75; H, 2.63; N,7.54). M.p. = 210°C; IR (KBr): 1706, 1699 (2 C = O), 1598 (C = N) cm-1; 1H NMR (300 MHz, DMSO-d6) δ: 2.26 (s, 3H, CH3), 7.42-7.85 (m, 9H, ArH’s); 13C NMR (75.46 MHz, DMSO-d6) δ: 27.58, 113.13, 119.26, 121.35, 124.08, 125.65, 127.11, 128.45, 129.69, 132.45, 134.00, 135.04, 143.01, 149.19, 190.98, 196.01. MS (m/z): 426 (M+). (Calc. : C, 56.35; H, 2.84; N, 6.57. C20H12F6N2O2 Found: C, 56.68; H, 2.71; N,6.37). M.p. = 180–182°C; IR (KBr): 1723, 1699 (2 C = O), 1598 (C = N) cm-1; 1H NMR (300 MHz, DMSO-d6) δ: 1.29 (t, 3H, J = 7.2 Hz, CH3), 2.23 (s, 3H, CH3), 4.01(q, 2H, J = 7.2 Hz, CH2), 7.28 (d, 2H, J = 8.4 Hz, ArH’s), 7.65 (d, 2H, J = 8.4 Hz, ArH’s); 13C NMR (75.46 MHz, DMSO-d6) δ: 13.11, 29.18, 58.11, 113.26, 119.01, 125.36, 132.58, 136.00, 148.39, 160.07, 162.37, 192.10. MS (m/z): 344 (M+). (Calc. : C, 52.33; H, 3.51; N, 8.14. C15H12F4N2O3 Found: C, 52.61; H, 3.38; N,7.99). M.p. = 212°C; IR (KBr): 1725, 1701 (2 C = O), 1598 (C = N) cm-1; 1H NMR (300 MHz, DMSO-d6) δ: 0.91 (t, 3H, J = 7.6 Hz CH3), 4.23 (q, 2H, J = 7.6 Hz, CH2), 7.21-7.78 (m, 9H, ArH’s); 13C NMR (75.46 MHz, DMSO-d6) δ: 13.26, 58.25, 112.31, 115.25, 118.01, 119.27, 125.87, 128.97, 131.98, 132.68, 134.85, 137.50, 148.05, 159.98, 163.00, 194.28. MS (m/z): 406 (M+). (Calc. : C, 59.12; H, 3.47; N, 6.89. C20H14F4N2O3Found: C, 59.39; H, 3.34; N,6.75). M.p. = 192–194°C; IR (KBr): 1721, 1699 (2 C = O), 1599 (C = N) cm-1; 1H NMR (300 MHz, DMSO-d6) δ: 0.89 (t, 3H, J = 7.2 Hz, CH3), 2.29 (s, 3H, CH3), 4.00 (q, 2H, J = 7.2 Hz, CH2), 7.67 (d, 2H, J = 7.8 Hz, ArH’s), 7.89 (d, 2H, J = 7.8 Hz, ArH’s); 13C NMR (75.46 MHz, DMSO-d6) δ: 13.56, 28.88, 59.58, 116.48, 121.33, 123.58, 125.47, 126.05, 127.89, 132.11, 141.05, 146.36, 159.87, 192.01. MS (m/z): 394 (M+). (Calc. : C, 48.74; H, 3.07; N, 7.11. C16H12F6N2O3 Found: C, 49.05; H, 2.94; N,6.93). M.p. = 207–208°C; IR (KBr): 1722, 1701 (2 C = O), 1602 (C = N) cm-1; 1H NMR (300 MHz, DMSO-d6) δ: 1.16 (t, 3H, J = 7.2 Hz CH3), 3.91(q, 2H, J = 7.2 Hz, CH2), 7.51-7.88 (m, 9H, ArH’s); 13C NMR (75.46 MHz, DMSO-d6) δ: 13.98, 59.04, 114.52, 118.12, 121.54, 121.55, 125.87, 126.02, 128.11, 128.95, 132.05, 132.97, 134.23, 142.31, 148.00, 162.45, 196.10. MS (m/z): 456 (M+). (Calc. : C, 55.27; H, 3.09; N, 6.14. C21H14F6N2O3 Found: C, 55.58; H, 2.95; N, 5.97). M.p. = 227–229°C; IR (KBr): 1725, 1705 (2 C = O), 1602 (C = N) cm-1; 1H NMR (300 MHz, DMSO-d6) δ: 1.19 (t, 3H, J = 7.00 Hz, CH3), 2.21 (s, 3H, CH3), 3.95 (q, 2H, J = 7.00 Hz, CH2), 7.60 (d, 2H, J = 7.8 Hz, ArH’s), 7.52 (d, 2H, J = 7.8 Hz, ArH’s); 13C NMR (75.46 MHz, DMSO-d6) δ: 13.52, 28.06, 58.56, 115.18, 121.33, 125.18, 127.51, 132.55, 133.00, 146.15, 159.11, 190.00. MS (m/z): 360 (M+). (Calc. : C, 49.95; H, 3.35; N, 7.77. C15H12ClF3N2O3 Found: C, 50.21; H, 3.27; N,7.59). M.p. = 250–251°C; IR (KBr): 1723, 1703 (2 C = O), 1602 (C = N) cm-1; 1H NMR (300 MHz, DMSO-d6) δ: 0.95 (t, 3H, J = 7.2 Hz CH3), 3.99(q, 2H, J = 7.2 Hz, CH2), 7.62-7.95 (m, 9H, ArH’s); 13C NMR (75.46 MHz, DMSO-d6) δ: 13.90, 59.22, 114.00, 117.45, 121.17, 126.89, 128.12, 128.57, 132.00, 133.09, 133.89, 139.11, 147.52, 159.47, 192.13. MS (m/z): 422 (M+). (Calc. : C, 56.82; H, 3.34; N, 6.63. C20H14ClF3N2O3 Found: C, 57.03; H, 3.28; N, 6.48). This project was funded by the Deanship of Scientific Research (DSR), King Abdulaziz University, Jeddah, under grant No. (291-372-1432). The authors, therefore, acknowledge with thanks DSR technical and financial support. The current study is the outcome of constructive discussions between ASA and TSS, ASA and TSS carry out the synthesis and characterization experiments. HMA carried out the GC-MS analysis and ASA and TSS carried out the 1H NMR, 13C NMR and 2D NMR. ASA and TSS carried out the elemental analyses. ASA and TSS, were involved in revising the manuscript. All authors have read and approve of the final manuscript.